Battery-Powered, Heavy-Duty Pusher features ergonomic handle. Built with transaxle design that enables smooth operation on uneven surfaces, pedestrian-operated Super Power PusherÂ® allows one person to push, pull, and maneuver wheeled loads of up to 150,000 lb up 5% grade. Ergonomic handle encircles hands for protection and provides fingertip speed control as well as built-in belly kill switch. Anti-runaway pusher also features automatic braking and programmable control system for setting accel/decel limits. Reduce your labor and time to move wheeled loads up to 150,000 lbs. If it rolls....we can move it. Shakopee, Minn.-NuStar, Inc. introduces the new and improved Super Power Pusher® pedestrian-operated, battery-powered pusher with a new handle. The Super Power Pusher(TM) is a significantly more powerful version of the standard Power Pusher®. It has the same ability to push, pull and maneuver virtually any heavy industrial load on wheels and uses its own modular range of attachments for handling rolling loads up to 150,000 lbs., or those with high rolling resistance. The new ergonomically-designed, standard equipment handle encircles the hands for greater protection. This helps protect the operator when maneuvering a load or turning corners. The new handle has fingertip speed control and a built-in belly kill switch. Switching from forward to reverse and back again is also safer and easier. 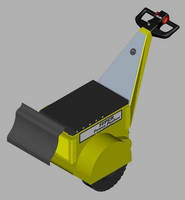 This new handle makes the Super Power Pusher smoother, safer and easier to operate. The Super Power Pusher is designed to allow one person to move wheeled loads weighing up to 150,000 lbs. up a 5% grade without forklifts or other more expensive ride-on equipment. It increases productivity by reducing the number of employees needed to move heavy objects. It also creates a safer work environment by reducing the risk of injury and by keeping the load under control. They are less expensive and easier to store than forklifts or tractors, plus operators do not need a license. The Super Power Pusher has variable speed with soft touch control. It has automatic braking and is anti-runaway. A 3-stage, 3 x 15 amp output 110v or 240v charger is built right in. Simply plug it in to recharge the three batteries. The fully programmable control system lets you set acceleration/deceleration limits. The transaxle design lets the unit operate smoothly on uneven surfaces, indoors or out. It is easy to operate and maintain. Invented in the 1960s for pushing immobilized vehicles, the Power Pusher is an ideal choice for many harsh and hazardous situations where you need to push or pull wheeled loads. Industries using the Power Pusher include railroad, construction, utilities, heavy machinery, automotive, trucking, paper, hospitals and other manufacturing sites. One person can maneuver and move heavy cars, carts, machinery, instruments, hospital beds, trolleys, racks, drums, pallets, containers and more. The soft touch control allows smooth and accurate maneuvering so even delicate breakable loads move easily and safely. Reduce the risk of back injury while improving your productivity. Let us show you how the Power Pusher can pay for itself in less than year and help you determine which Power Pusher model and options are best for you. Options include hitches, tow bars, strobe, motion beeper and push plates. Custom options make the Super Power Pusher meet your exact needs! Headquartered in Shakopee, MN, NuStar, Inc. is a privately-held corporation specializing in the design, manufacture, marketing and sale of pedestrian-operated, battery-powered pushing and tug units for pushing, pulling and maneuvering an incredible range of wheeled and semi-wheeled loads. With over 23,000 units sold since 1964, we are ready to handle any type of material handling needs you have. For more information, visit: www.powerpusher.com. Self-Facing System maximizes cooler case merchandising impact. Cutting Machine automates positioning, compound mitering. Snow Pusher Attachments mount to wheel loader buckets. Plastic Merchandising Trays organize food products.